MINDY NETTIFEE is the author of Sleepyhead Assassins from Moon Tide Press, as well as Write Bloody books: Rise of the Trust Fall and Glitter In The Blood, A Poet’s Manifesto for Better, Braver Writing. A force in the National Poetry Slam scene since 1998, Mindy has performed and taught at hundreds of universities and venues across America and Europe, opened for indie rock act the Cold War Kids, and as co-founder and director of the literary nonprofit Write Now Poetry Society, has curated poetry events for the Smithsonian, the Getty Center, the Los Angeles County Arts Commission and more. BRIAN S. ELLIS was born in Manchester, NH and currently lives in Portland, OR. He is the author of Write Bloody books: Uncontrolled Experiments In Freedom and Yesterday Won’t Goodbye, as well as two collections from University of Hell Press: American Dust Revisited and Often Go Awry. 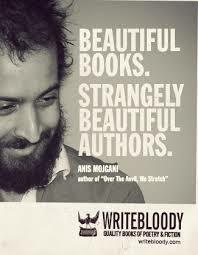 ANIS MOJGANI is a two time National Poetry Slam Champion, winner of the International World Cup Poetry Slam, and multiple-time TEDx Speaker. He has been awarded residencies from the Vermont Studio Center, AIR Serenbe, and the Oregon Literary Arts Writers-In-The-Schools program. His work has appeared on HBO, NPR, and in the pages of such journals as Rattle, Forklift Ohio, Paper Darts, and Thrush. Anis is the author of four Write Bloody books: Songs From Under the River, The Feather Room, Over the Anvil We Stretch, and his latest, The Pocketknife Bible, a fully illustrated poetry-novella.